DUBAI, United Arab Emirates (Sept. 16, 2004)­- Golf in the Middle East. Raising the concept provokes most Americans to scratch their heads and wait for a politically incorrect punch line. But golf in the Middle East is no joke, as evidenced by the golf course building boom happening in Dubai to match the overwhelming demand for starting times. 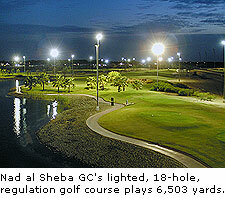 Arabs generally do not play golf, but the hundreds of thousands of ex-Pats and visitors to Dubai flood the courses. To play golf late in the warm evening under a violet sky and see the ornate, floodlit twin domed spires of a mosque gleaming on the horizon is to understand that golf has once again ignored political and geographical borders to transcend yet another culture. Dubai has hosted Tiger Woods, but Americans here in this luxurious Arabian oasis are still very scarce. The golf craze booms on here, though, and the resorts and courses being built in Dubai are created in the style of America 's best golf resorts. "Golf is important. We hope we have the proper accommodations and are well-organized to receive Americans," said Pascal Despieres, the French woman who is marketing manager for Dubai Golf, the government's organization coordinating golf tourism. We chatted over lunch at the Emirates Golf Club, home of the Dubai Desert Classic, which was won this year by American Mark O 'Meara. O'Meara, who is from Orlando, beat his younger friend and neighbor Tiger Woods and a field of other well-known PGA Tour players. Though Woods didn't win, he received a great deal of attention for hitting golf balls from the rooftop helicopter pad of the world famous Burj al Arab Hotel ­ Dubai's famed landmark, all-suites hotel with gold-plated rooms that go for $1,500 per-night. The Burj al Arab, shaped like a mammoth sailboat, towers some 400 meters over the golden sandy beach along the Persian Gulf's crystal waters. "Golf is a big plus for Dubai. America is first in terms of numbers of golfers, so even if we get 0.5-percent of Americans to come, it is good," said Derpieres. Americans? Come to the Middle East to play golf? "I know. 'Lots of luck,' right?" she said. American notions of golf in the Arab desert include golfers putting on oiled sand greens and hitting shots off of a little piece of astro-turf they carry around through the dunes. That stereotype is not unfounded, because the original Dubai Country Club's sand golf course still exists and has more than 500 members! There's plenty of grass to play on in this oasis too, since golf courses have been built or are under construction by designers and golf stars such as Robert Trent Jones II, Jack Nicklaus with Ian Baker Finch, Gary Player, Desmond Muirhead with Colin Montgomerie, and Thomas Bjorn. The model for Dubai's golf course boom is American in style. The eight golf courses and facilities, with more on the way, are conceived and built not in the Spartan fashion of many of golf's original clubs in the United Kingdom, but rather with the comforts and appointments that Americans added to the game: motorized golf carts, automated GPS yardage devices, beverage carts and half-way houses, comfortable locker rooms, and golf shops stocked with quality equipment and fashionable apparel. No caddies, however, as there is little demand for them. 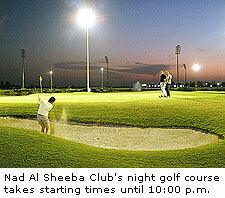 The temperatures aren't always extreme, and the heat can even be avoided by playing golf at Nad al Sheeba Club, a regulation 18-hole golf course that is open until midnight because it is fully illuminated by floodlights! "I am sure it is only a matter of time before we build an air conditioned, indoor golf course here," said Despieres, who is looking forward to the completion of an indoor snow-skiing hill at Dubai's Sports Complex in 2005. It is disingenuous to think that only the heat and misguided notions about the quality of golf make Americans wary of coming to Dubai. "We want Americans to come. We got Tiger Woods," I was told by Marwan Al Marri, who is an officer with the Government of Dubai's Department of Tourism. We spoke in a 13th floor conference room in a gleaming skyscraper overlooking the city. Al Marri wore his traditional white Arab formal wear robe with the white headdress, held in place by a black ring. He lived in the United States for nine years and knows that Americans are fearful to vacation in a Middle Eastern country. "American's think Dubai is next door to Baghdad. The only thing we know about a war here is what we see on CNN." My sense after a week here is that Dubai is more a world city than an Arabic one. Of Dubai's 1.5 million residents, only 200,000 are UAE nationals. The rest are foreigners of all varieties from over 150 nations ­ people from Europe, South America, Australia, the Far East, and even North America. The tournament director of the Dubai Desert Classic is an Englishman from Yorkshire, and the Emirates, Nad al Sheeba, and Dubai Creek clubs each have American greens superintendents. "We bring the most talented people in their fields to come here and show us how it is done," said Al Marri. "Dubai is only 30 years old. We want to learn to do everything in a world-class manner. We spare no expense in Dubai." Dubai was an outpost of 5,000 people in the 1950s. In 1967, oil was discovered, which gave the ruler, His Highness Sheikh Ahmed bin Saeed Al Maktoum, essentially an endless reserve of resources and no budget-limit to build what has become a spotless, contemporary, model city with no taxes, free health care, and a zero-crime rate. "You can try all you want to get into trouble here and you can't," said Al Marri. Dubai is the most liberal and progressive of all Middle Eastern countries. "The only three things we don't tolerate are disrespect to women, intolerance against any form of religion, and drugs." While some of the Muslim women here prefer to wear traditional head covers and sometimes even face cloths, regular resort casual wear is perfectly acceptable. Evenings are dressy yet still casual. Only businesspeople wear ties. You won't find menacing armed guards when you get off of your Delta, Emirates Air, British Airways or Malaysian Air flight into Dubai. What you will find is a gleaming airport more reminiscent of McCarran Airport in Las Vegas of the Mall of America in Minnesota. Dubai feels like a giant "Middle East Epcot Center" exhibit showcasing the best the west has to offer without any of the negatives. American companies and familiar franchises abound ­ GM, Daimler Chrysler, and Ford, Hewlett Packard, Dell, TGI Friday's, Planet Hollywood, Hard Rock Café, Chili's, Burger King, Baskin Robbins, Ritz Carlton, Hyatt, Sheraton, Hilton, NIKE, and on and on. The shopping experience here ranges from the traditional outdoor bazaar variety to glamorous malls with food courts and cinemas. Personally, I've opted for a more culturally diverse experience. I' ve been welcomed at Mosques, visited Arabic nightclubs, drank camel's milk, and even attended the Arabian Grammy Awards. It wasn't easy to get me away from the golf courses, the magnificent beach at the Arabian themed Mina A'Salam Resort and Wild Wadi ­ the world's most technologically advanced water park. Families, women and children are welcomed, and will feel comfortable and safe in Dubai. International industry associations have pegged Dubai as one of the best emerging golf destinations in the world, but you'll have to see it to believe it. 27 holes: Al Awir Course: 6,477 yards, par-71. Opened in 1971. 9-hole Creek Course shorter for beginners and juniors. Note: Entire course is sand. Golfers are given a piece of artificial turf to carry with them and hit their shots from. Greens are soaked in oil and brushed for smooth, fast putting. 36 holes: Majlis Course, 7,101 yards, par-72. Opened: 1988. Architect: Karl Litten. Wadi Course, 7,100 yards, par-72. Opened: 1996. Architect: Jeremy Pern/Karl Litten. Note: Majlis Course hosts the European Tour's Dubai Desert Classic. Ernie Els shot course record 61. 27 holes: Championship Course: 6,839 yards, par-71. Reopens in Dec. 2004. Architect: Ryder Cup star Thomas Bjorn. 9 hole, floodlit, par-3 course. Note: The landmark clubhouse is designed to resemble the sails of a traditional Arab dhow (boat). Park Hyatt is building attached hotel. 18 holes: 6,503 yards, par-71. Opened: Front nine: 1993; back nine, 1996. Completely floodlit for night play. Links-style course has double green and crossing fairways. Note: Inward half plays inside the oval of the Nad Al Sheeba Race Course, home to the Dubai World Cup, the world's richest horse race. 9 holes, 3,299 yards, par-36. Four sets of tees allow for varying lengths on second loop. Played alongside the marina. A saltwater lake comes into play on five holes. Note: Tiger Woods, Ernie Els, Darren Clarke, and others have played in challenge matches at Jebel Ali as par of the Dubai Desert Classic. 18 holes: 7,308 yards, par-72. Opened: 2003. Architects: Colin Montgomerie and Desmond Muirhead. Note: 14 lakes and 72 bunkers, plus the world's largest green: 58,000 square-foot 13th is built in the shape of the United Arab Emirates. 18 holes: 7,698 yards, par-72. Opened: 2004. Architects: Jack Nicklaus with Ian Baker Finch. Note: No water hazards ­ just desert sand bunkers. 18 holes to open in late 2004. Architect: Robert Trent Jones II. Note: 11 lakes, small streams, and "rivers of sand."